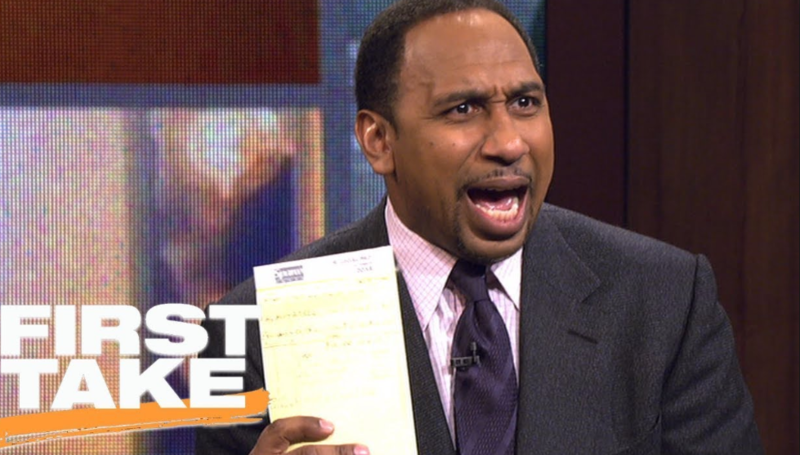 It was reported earlier this month that Stephen A. Smith is in line to become the highest paid on-air talent in ESPN history when he signs his new contract. He could earn between $8 to $10 million a year. People on the Internet love to point out how wrong Smith’s takes can be at times. But people don’t tune in to ESPN for accurate predictions. One of the best parts about sports is how unpredictable they can be. I used to watch ESPN for the highlights but now that those are available instantaneously elsewhere, people tune in for the entertainment value of the takes, whether they agree with them or not. There’s something for everyone with the hot take machine in sports because they either confirm your priors or make you angry at how wrong they seem. Rooting for or against hot takes has almost spawned an entirely new sport of its own. Smith owns this space and you could say he’s probably worth every penny for the amount of air time he gets. Hot takes are a way to stay relevant when we’re swimming in a sea full of opinions. Which brings me to everyone’s favorite personal finance punching bag over the past few weeks — Suze Orman. I’m not a coffee drinker but it seems to me like you’d have to have an unbelievably large coffee habit to pull this off. This advice sounds good because the latte factor is catchy but it’s not useful advice. If a coffee a day is going to ruin your retirement you have much bigger financial troubles to worry about. I get what she’s trying to say. Discretionary purchases can add up and if you have too many of them it will be impossible to ever save a meaningful amount of money. In her million dollar coffee example, Orman assumes someone spends $100/month of coffee. That $100 would turn into $1 million after 40 years assuming a 12% annual return. A 12% annual return sounds wonderful in a latte factor example but it’s not realistic. When Dave says you can expect to make a 12% return on your investments, he’s using a real number that’s based on the historical average annual return of the S&P 500. The S&P 500 gauges the performance of the stocks of the 500 largest, most stable companies in the New York Stock Exchange—it’s often considered the most accurate measure of the stock market as a whole. The current average annual return from 1923 (the year of the S&P’s inception) through 2016 is 12.25%. That’s a long look back, and most people aren’t interested in what happened in the market 80 years ago. Ramsey is kind of right about these numbers but it’s also misleading. I looked and the arithmetic average on the S&P 500 is 11.36% from 1928 to 2018. But the geometric average was only 9.49%. The reason the geometric average is more important to investors is that it takes compounding into account, which is what matters to real people. For example, if you gain 50% in one year but lose 50% in the next your arithmetic average return would be 0%. But your geometric average would be -25%, meaning if you started with $100, you would now only have $75. The first average doesn’t do anyone any good in the real world. Ramsey could always change his stance on this but I’m guessing he never will. Like Stephen A. Smith, he probably likes the back and forth on these types of hot takes. The arguments and hate from the investment community give him fuel. And maybe it doesn’t matter all that much. Ramsey’s advice on budgeting, spending, the problems with debt, and how to pay off borrowed money has probably done more good than any sort of investment advice he could ever offer. Just getting people to the place where they have enough money to invest in the markets is a win for a large percentage of the population. Ramsey and Orman have both done a lot of good over the years giving people advice about getting out of debt and avoiding the traps of consumerism and how it can take over your finances. Just remember much of what they’re telling you now is more about entertainment than advice. Orman says she would never waste money on a daily coffee habit but she also owns a mansion on a private island in the Bahamas. And she claims to spend hundreds of thousands of dollars to fly private each year. Ramsey makes millions of dollars a year on his syndicated radio show. Taking personal finance advice from the rich and famous can be hazardous to your wealth because eventually, these people can lose touch with reality. Much of what they’re now doing is personal finance hot takes to keep things interesting. And maybe they’ve earned that right by being fabulously successful at selling their messages to the masses. Giving advice made these two rich and famous, which in some ways makes it harder for them to offer advice to normal people anymore.